By Stella Nikolaou, Clinical Research Fellow, The Royal Marsden Hospital and Imperial College London and Shahnawaz Rasheed, Consultant Surgeon, The Royal Marsden Hospital and Senior Lecturer, Imperial College London. Worldwide, there are more than 5 million people who die from violence and injury1. Uncontrolled bleeding causes more than 40% of trauma-related deaths1. More than 530 000 women die each year during pregnancy, childbirth or post partum and 99% of these women are in low and middle-income countries with severe bleeding being the commonest cause of death1. Safe and affordable surgery, therefore relies on access to a sufficient volume of blood which can be safely transfused2. Unfortunately this is not the case in most of the world2. Blood donation rates are lowest in nations, which are afflicted with high rates of malnutrition, chronic anaemia and transfusion-transmissible infections (TTIs) which further decrease the blood donor pool2. The Lancet Commission of Global surgery recommends blood donation of at least 15 units per 1000 people per year3. However according to the WHO data in 2015, the median blood donation in low income countries (LICs) is 3.9 units/1000 people/year and 11.7 units/1000 people/year in Middle Income Countries (MICs) which is a tenth of what high income countries are estimated to have (36.8 units/1000 people/year)4. These figures are likely to be overestimated as they include blood that is unsafe to use due to TTIs (e.g. AIDS, malaria and syphilis)2. The reasons for such low blood donations are many and include poor health infrastructure and misconceptions regarding blood donations which are influenced by cultural and religious factors5. In countries like India, despite the fact that 68% of its population is rural, most of its blood banks and donation centres are actually situated in urban areas4. There are 3 types of blood donors: voluntary unpaid, family and paid6. According to WHO data, the first group which is also the safest group to provide blood, is gradually increasing in LMICS, despite the above limitations6. There are still countries (61 LMICs and 11 HICs) where more than 50% of the blood supply is dependent on family/replacement and paid blood donors with ethical, safety and logistical disadvantages6. Unbanked direct blood transfusion (UDBT) is an alternative many clinicians resort to. This involves a family member or friend to provide blood which is screened for TTIs with a rapid testing kit and a blood type cross match and then directly transfusing it to the patient7. Although this is not ideal as the rapid testing kit is not as sensitive in detecting TTIs, coercion for donation is high and the whole blood is transfused, it can provide an alternative in a situation where a blood transfusion is required for a life-saving operation4. 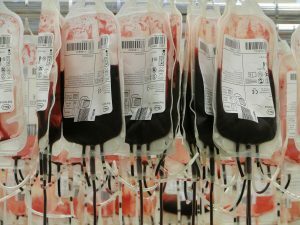 The WHO has been at the forefront of raising awareness of unsafe blood and chronic blood shortage and has recommended strategies in order to tackle this6. Establishing a national blood system and providing the appropriate infrastructure with quality-assured screening of all donated blood for TTIs will lay the foundation for a better donor population2,6. By engaging the local community and religious leaders, myths regarding blood donation can be dispelled and a higher unpaid volunteer blood donor pool can be achieved2. 2 Raykar NP, Kralievits K, Greenberg SLM, Gillies RD, Roy N, Meara JG. The blood drought in context. Lancet Glob Heal 2017; 3: S4–5. 3 Meara JG, Leather AJM, Hagander L, et al. Global Surgery 2030: evidence and solutions for achieving health, welfare, and economic development. Lancet (London, England) 2015; 386: 569–624. 4 Jenny HE, Saluja S, Sood R, et al. Access to safe blood in low-income and middle-income countries: lessons from India. BMJ Glob Heal 2017; 2: 1–7. 5 Dubey A, Sonker A, Chaurasia R, Chaudhary R. Knowledge, attitude and beliefs of people in North India regarding blood donation. Blood Transfus 2014; 12. DOI:10.2450/2012.0058-12. 6 WHO | Blood safety and availability. WHO 2016. 7 Alexander PE, Barty R, Fei Y, et al. Transfusion of fresher vs older red blood cells in hospitalized patients: A systematic review and meta-analysis. Blood. 2016; 127: 400–10.